NEW YORK—The Institute of Noahide Code, a non-governmental organization with consultative status at the United Nations, hosted an event at 777 UN Plaza on Monday called “One People, One World.” The organization was conceived as an opportunity to unite the world by re-affirming the belief in the One G-d as the Creator of all human beings and the belief that we are all created in the Divine Image. 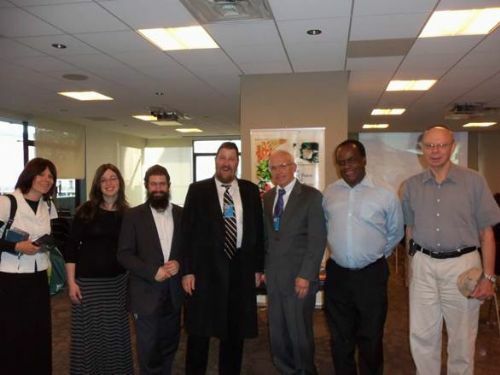 The event, led by Rabbi Yakov D. Cohen, gathered people hailing from six different countries (Belgium, Canada, China, Israel, Moldova and the United States) and from all walks of life: rabbis, diplomats, students, business people, journalists and former soldiers. All attended with a commitment to securing world peace according to the Seven Laws of Noah. Pursuant to the same theme, Mr. Phil Nussbaum, Chair of the Raoul Wallenberg International Movement for Humanity also placed emphasis on cooperation among the nations. Raoul Wallenberg, a Swede, saved over 100,000 Jews during the Holocaust. Despite not sharing their nationality or religion, one man—Mr. Wallenberg rescued members of the Jewish people from certain destruction. Though Wallenberg has been missing since the close of the Second World War, the Raoul Wallenberg International Movement for Humanity continues to promote the values exemplified by this humanitarian action. You can learn more about the Institute of Noahide Code at www.Noahide.org and view video recordings of this and other events, programs and lectures at www.youtube.com/channel/UCqLMfZw-nDl3zpMPDicTp0Q.